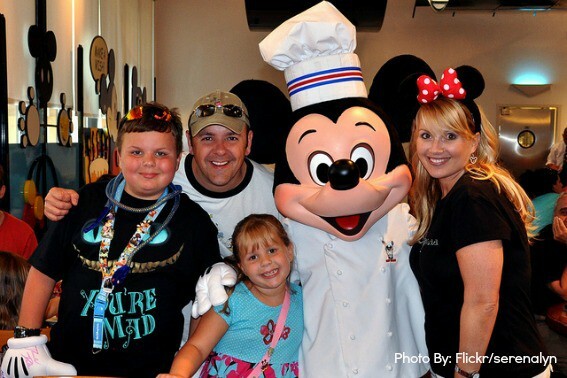 Once upon Orlando, there was a fun and adventurous family that came to visit. They had always dreamed of visiting “The Happiest Place on Earth,” but they didn’t realize there was so much to do in one city! When there are one million and one activities, how is a family to decide? 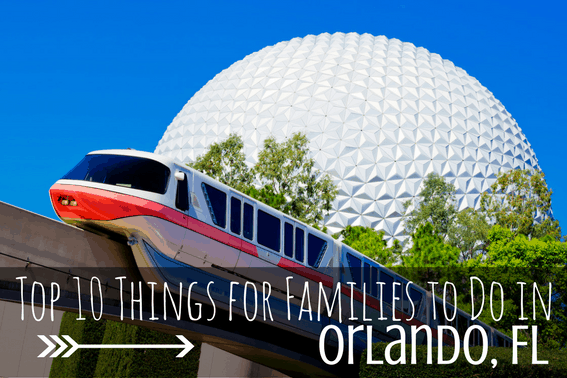 We’ve helped you narrow the top Orlando attractions down; enjoy our Top 10 things for families to do in Orlando! Pop into downtown Orlando where you can take a romantic/family-friendly swan boat ride on Lake Eola. Explore the bustling urban corridor where you’ll find plenty of nightlife, dining, and shopping. Take in an Orlando Magic basketball game at the Amway Center. Just minutes from downtown Orlando is the historic Winter Park and the South’s Park Avenue. Park Avenue is famous for its brick streets lined with beautiful live oaks and a mix of modern and historic homes. Each weekend, you’ll be able to dine, shop, and visit a festival or a farmers market. Sadly, many visitors often miss this side of the city, the first of the top Orlando attractions, so be sure to catch the real Orlando downtown. Experience the world of the sea like never before. Kids who love the water just might want to investigate all that SeaWorld Parks has to offer. Go on a once-in-a-lifetime underwater journey to learn about killer whales, dolphins, beluga whales, manatees, penguins, sharks, and manta rays to name a few. Interactive experiences, shows, thrilling (and chilling) adventures, and even more up-close animal encounters happen every day. SeaWorld’s commitment to animal care, conservation, rescue, and research are evident all over the park. Insider’s Tip: The Orlando Flex Ticket gives you unlimited admission during the length of your stay to SeaWorld, Aquatica, SeaWorld’s Waterpark Orlando, Universal Studios Florida, Islands of Adventure, and Wet ‘n Wild. Five parks for one price. The I-Drive 360 entertainment complex is the coolest place you’ll want to visit for an afternoon or evening when not at a theme park or lounging at your hotel pool! 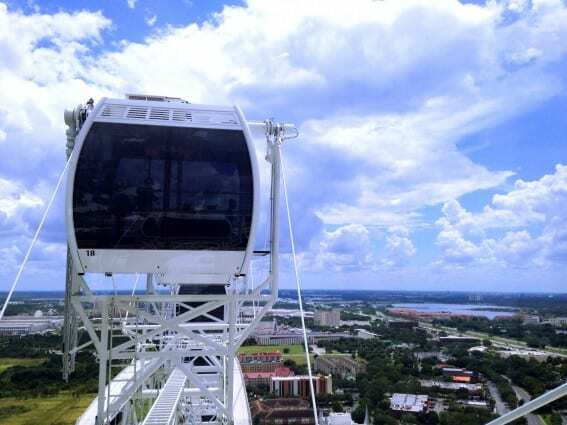 The Orlando Eye is a sight to behold and gives you the most amazing views of the city! It’s air conditioned and will take you upwards of 400 feet in the sky! On a clear say, you’ll be able to see all the way to Kennedy Space Center for some road schooling with space exploration! 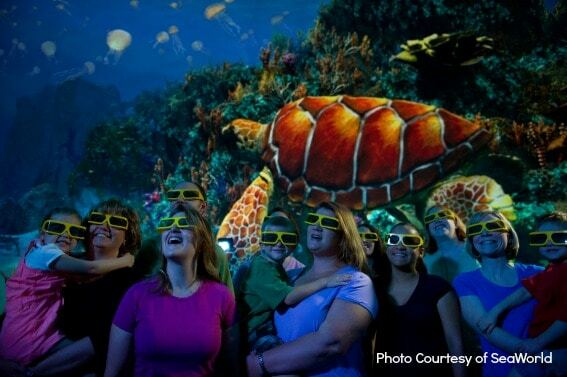 While you are there, visit SeaLIFE Aquarium to see the over 5,000 sea creatures and the coolest 360-degrees ocean tunnel! Pop over to Madame Tussauds and hang with the likes of Jimmy Fallon, Taylor Swift or Pitbull (well, at least their wax doubles will be there!) Take a selfie and let everyone know you visited the coolest wax museum in Orlando! Top off the night at the Sugar Factory and treat your sweet tooth to some amazing sugar concoctions! You won’t know what to eat first, but you won’t forget this place either! Enjoy a panoramic view of an early morning sunrise above this most magical city. 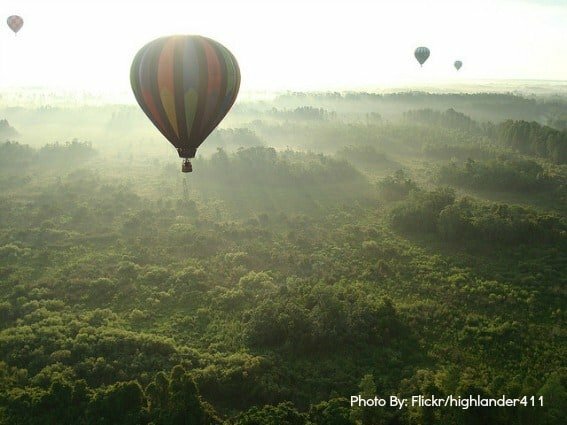 Make this trip once upon Orlando that much more memorable with a hot air balloon ride overlooking Central Florida, reminiscent of the movie, Up. Fly away and experience the world like you have never seen before. Learn why there is a traditional champagne toast after every balloon ride. It’s an unbelievable experience. Equally fantastic, Cirque du Soleil – La Nouba and the Blue Man Group shows are must-sees for the whole family. Each show has had a long-standing presence in Orlando; since 1998, La Nouba has been one of a handful of permanent Cirque du Soleil shows. Its home is a custom-designed, freestanding structure built especially for Cirque du Soleil at Downtown Disney. The exquisite costumes, lighting, music, and acrobatics will leave families in awe and even the youngest of children will enjoy the show. With each act more intriguing than the last, this Cirque du Soleil show will be unforgettable. 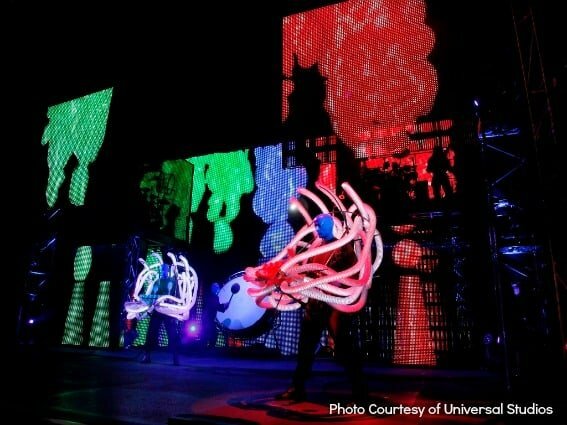 Since 2007, the worldwide phenomenon know as Blue Man Group has permanently lived at the Aquos Theatre at Universal CityWalk Orlando. The award-winning show is 90 minutes of non-stop action packed with insane music, art, technology, color, and humor. There is a free meet-and-greet after the show, and kids will LOVE getting to interact with everyone they just saw on stage. Be careful what “zone” you sit in as you might end up wearing some of the show! Overall, trying to tell you which one to see is like comparing Broadway’s Phantom of the Opera to The Lion King. People enjoy them both, but everyone has one they like just a little bit better. 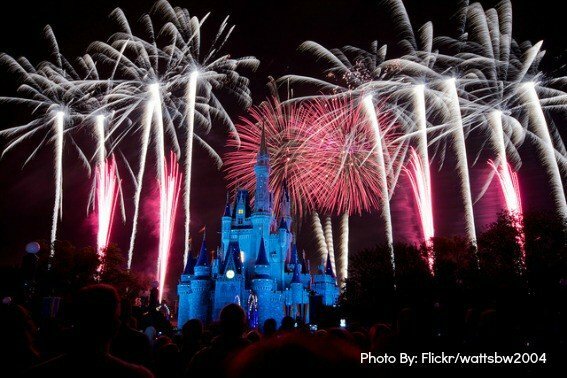 Typically, a vacation to Orlando will probably allow time to see just one show. Insider’s Tip: If you are going to Orlando during high season, reservations can be made up to six months in advance. Let’s face it. Florida is hot. Our tropical climate is perfect for an all-day water adventure! Venture to one of Orlando’s top-rated water parks to cool down amidst lagoons, beaches, rides and slides, or lazy rivers. At Aquatica, brave the watery free-fall on the all-new drop slide Ihu’s Breakaway Falls, the tallest, steepest, and only multi-drop tower of its kind in Orlando. Race down two side-by-side enclosed tube slides that send riders racing through an underwater world home to a playful pod of beautiful black-and-white Commerson’s Dolphins. Head over to Disney’s Blizzard Beach to see snow-capped mountains and ski lifts while you wade in warm waters. One of two Disney water parks, Blizzard Beach is open year-round. Disney’s Typhoon Lagoon Water Park is currently closed for enhancements, but when it re-opens will be full of new attractions and thrills. Wet N’ Wild can easily fill an entire day with water fun for those over 36″ tall as most rides have height requirements. (Insiders Tip: Half price admission to Wet N’ Wild after 2pm daily!) For those under 36″, pack swimsuits and cool down at Universal Studios at Fievel’s Playland, Shamu’s Happy Harbour inside SeaWorld, and the Casey Jr. Splash ‘N’ Soak Station at Disney’s Magic Kingdom. Don’t forget the sunblock! Looking for a hotel with an awesome water park? Have no fear, there are plenty! The Gaylord Palms Resort, Nickeloden Suites Hotel, and CoCo Key Resort all have awesome water parks on site, so you just might not leave that hotel for a few days! Hold on to your Mouse Ears…Disney Springs is an exciting destination, all on its own. For more than 40 years, Disney Springs (formerly Downtown Disney) has been a fun place for families to go experience magic outside of a Disney theme park. Disney Springs is set to have 150 stores, distinctive dining experiences, and will also elaborate on fantastic entertainment. Architecture, costumes, landscaping, and of course, attention to design detail will have visitors flocking to this unique part of Walt Disney World, as a truly unique part of the overall Disney experience. You will definitely want to stop by and visit this brand new addition to the Disney World family. Discovery Cove is an unforgettable experience. As a much quieter and less crowded park, Discovery Cove offers an unbelievably intimate experience in an all-inclusive type atmosphere. There is peacefulness amidst the waters, the animals, the people, and the whole experience. Up-close and personal encounters with dolphins, sting rays, and sea turtles will have families talking long after the vacation ends. Take advantage of snorkeling in the freshwater or play hide-and-seek with thousands of beautiful fish via the SeaVenture. Explore underwater beauty like never before. Children must be age six or older to swim with the dolphins. If this type of water adventure is on your bucket list, book this day in advance, and mark it on your vacation schedule. 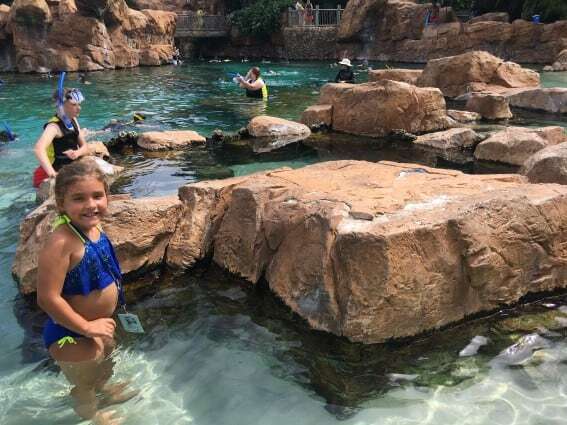 Insiders Tip: Unlimited admission to SeaWorld Orlando and Aquatica, SeaWorld’s Waterpark, is included for 14 days surrounding your visit to Discovery Cove. Admission to Busch Gardens Tampa can be added for an additional charge. But having only a limited amount of guests, free food and the unique animal encounters makes this one of our favorite places to visit! Think that Universal Orlando is only for grown-ups and big kids? Think again! 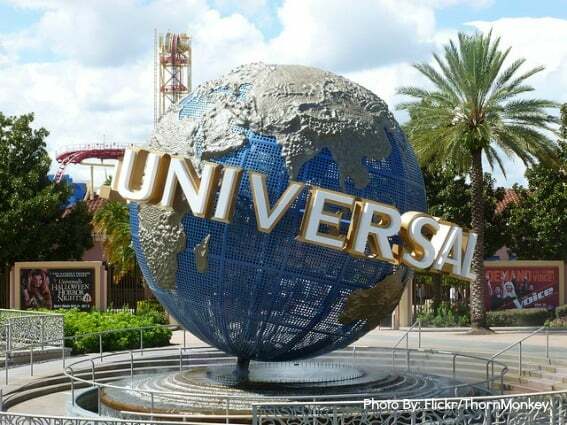 With two separate parks (Universal Studios Florida and Islands of Adventure), a night-time entertainment complex, (Universal CityWalk Orlando), plus four amazing on-site hotels: Loews Portofino Bay Hotel, Hard Rock Hotel, Loews Royal Pacific Resort, and the new Cabana Bay Beach Resort, families will have no trouble finding something fun for everyone. Younger kids will adore Seuss Landing in Islands of Adventure and the whimsical rides including The High in the Sky Seuss Trolley Train Ride, Cat in the Hat, and the fun Caro-Seuss-El. 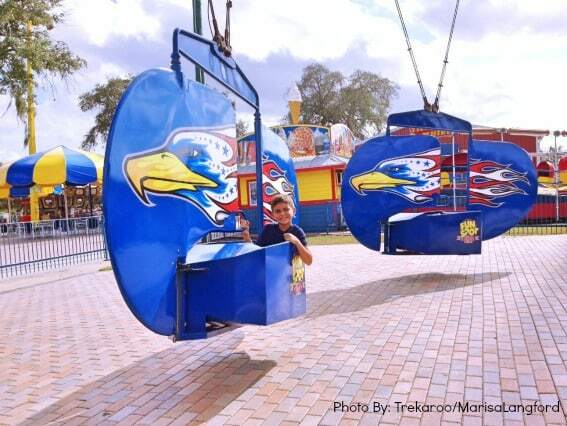 Universal Studios Florida has fun, kid-friendly rides including E.T., Despicable Me: Minion Mayhem, and the kid-sized thrill ride Woody Woodpecker’s Nuthouse Coaster inside the Woody Woodpecker’s Kidzone, an area dedicated to wee ones. Purchase Universal’s Superstar Character Breakfast to get access to a special parade viewing area so you won’t miss a thing! Do we have any Harry Potter fans out there? 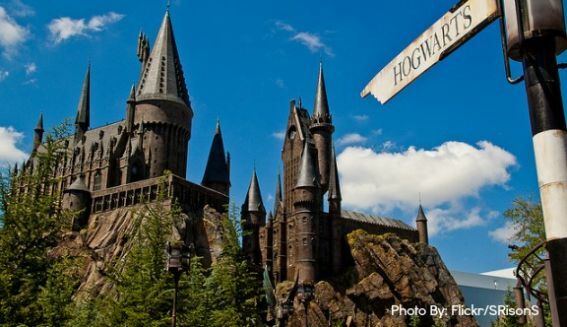 Families now have TWO options at Universal Orlando Resort to get their fill: Wizarding World of Harry Potter Hogsmeade and the latest addition, The Wizarding World of Harry Potter Diagon Alley. Hogwarts Express will carry you to both parks via Platform 9 3/4. Families that love thrill rides will adore Harry Potter and the Forbidden Journey and Harry Potter and The Escape From Gringotts, where each ride’s queue is almost as fun as the ride itself. Stick around for a fabulous dinner at one of the many fun, themed restaurants that immerse you in the world of movies, music and sports, or catch the Blue Man Group! Afterwards, play miniature golf with the kids at Hollywood Drive-In Mini Golf. So much to do…so little time on one vacation. RELATED: First Timer’s Guide to Universal Orlando and Sneak Peak at Universal in 2017! It’s a destination like no other. A top Orlando attractions post couldn’t be complete without Walt Disney World. When Walt Disney World in Florida opened in October of 1971, “The Happiest Place on Earth” was born. There’s a reason why Walt Disney World’s four major theme parks, Magic Kingdom, EPCOT, Disney’s Hollywood Studios, and Animal Kingdom, have more than 50 million visitors annually. While current ticket prices are far above the original price of $3.50 on opening day, tens of thousands of visitors still flock to see what Walt Disney dreamed and imagined in real life. Every park, every resort, and every detail has been carefully thought out with your best experience in mind. Trekaroo has the inside scoop for the first time visitor and the veteran to help plan your dream vacation! Everything from ‘where should I stay with my family’ to ‘how can I dine with Elsa’ is covered in our Ultimate Disney Vacation Planning Guide for Families. With over 450 hotels to choose from in Orlando, families will surely have their choice of places to stay! Hotels in Orlando are nearly as fun as the theme parks for kids as there are hotels with a wide variety of amenities such as character dining (not just Disney characters either), water parks, lazy rivers, and more! Disney Resorts: Let’s start with the 26 Disney Resorts at Walt Disney World. Disney hotels come in varied price points and varied experiences. Multi-generational families will appreciate the Art of Animation Resort where themed suites are built large for big families. A Disney deluxe resort such as the Animal Kingdom Lodge is nestled on a 46-acre savanna complete with up-close encounters of giraffes and zebras! Of course, staying at any Disney resort allows you a few perks like extra magic hours at the parks, FastPass + selections, and complimentary airport transportation along with the legendary Disney service (AKA Fairy Godmother and Pixie Dust) to help accommodate guests every need. Resorts with Theme Park Extras: The JW Marriott, connected to the Ritz-Carlton Orlando at Grande Lakes (and super close to SeaWorld and Universal Orlando) have shared pools, amenities, and the best lazy river in town. Staying at one of the Universal Orlando Deluxe Hotels like the The Loews Portofino Bay Hotel gives guests a “skip the regular lines for free” pass with Universal Express Unlimited ($89 per person value) included with your stay. However, the new Universal Orlando value resort Cabana Bay Beach Resort does not come with this perk, but you still get the early park admission to The Wizarding World of Harry Potter. 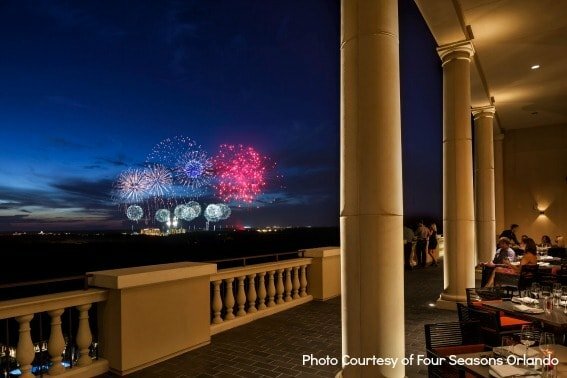 The Four Seasons Orlando is the newest property near Disney and has a 17th floor rooftop steakhouse with views of the nightly fireworks at the Magic Kingdom and Epcot. The Gaylord Palms sits just outside of Disney World and has complementary shuttles running to and from Walt Disney World along with access to the Everglades-inspired Cypress Springs Family Fun Water Park — exclusively for Gaylord Palms Resort guests. If you are looking to escape, visit the Omni at Champions Gate to enjoy the serenity of 15 acres of pools and recreational activities or a day at their signature Mokara Spa. Insider Tip: Staying at a hotel like the Gaylord Palms Resort in Kissimmee that has a built in waterpark and FlowRider will make staying onsite and having fun in between parks that much easier! Check out the above picture of the amazing water slides and water playground at the Cypress Springs Water Park! 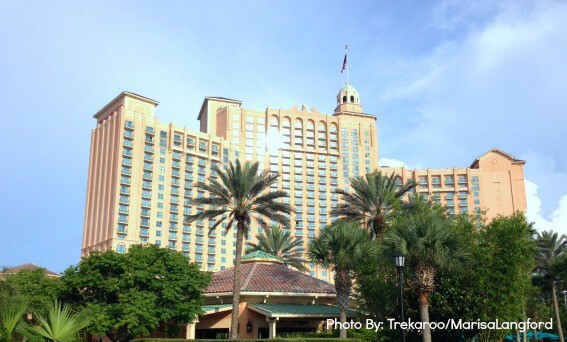 Check out Trekaroo’s reviews of Orlando area hotels. Just like hotels, a meal can be just as meaningful as a theme park experience, and Orlando boasts hundreds of great dining options for families. The more popular dining options will require advance reservations (ADR) because there are folks who plan their vacations down to the hour (possibly the minute). Disney Character Dining: A few of the most popular Disney character dining places are Chef Mickey at the Contemporary Resort to see the classic characters, princess dining at Akershuh Royal Banquet Hall in Norway at EPCOT, or Cinderella’s Royal Tables at Magic Kingdom in Fantasyland. If you are looking to dine with your favorite Disney Junior characters, you’ll want to visit the Hollywood & Vine at Disney’s Hollywood Studios. Guests of Disney’s Spirit of Aloha Dinner Show will dine on Polynesian cuisine while watching an elaborately choreographed show on the coast of the Seven Seas Lagoon. It’s considered one of the most amazing performances, so advanced reservations are highly recommended and can be made up to 180 days prior to your visit. If you just want a fun place to dine at Downtown Disney, the T-REX Cafe and the Rainforest Cafe never disappoint. We have even more tips for Disney Park dining too. Local Top Spots: If you’re in town on a Sunday, head over to the House of Blues for Gospel Brunch. Inspiring and soulful gospel performances fill the house while your plate runneth over with delicious food from the soul food brunch buffet. 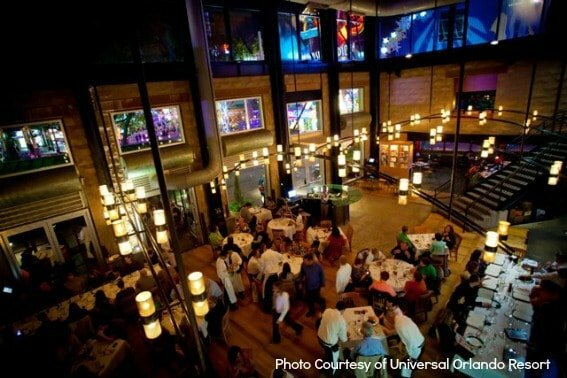 Make it a night on the town at Universal CityWalk and check out VIVO Italian, where everything is hand-made with love. Emeril’s Tchoup Chop located inside Loews Royal Pacific Resort at Universal Orlando has a beautiful atmosphere and delicious food. The locals might send you over to Winter Park for dinner at the 4 Rivers Smokehouse, the Ravenous Pig, or Luma on Park. Quaint, yet popular, these three foodie destinations will have you glad that you chose to explore the Orlando as a local. Kissimmee, located just south of Orlando and billed as the “gateway to fun,” offers families spacious hotels, many attractions, and beautiful resorts all within close proximity to Walt Disney World! Experience a different side of the traditional Orlando and jump into a “real Florida” vacation with an air boat ride, an up-close encounter with gators, a zipline safari, or a hot air balloon ride where guests soar above the treetops above Kissimmee’s wilderness. Take a trip back to Medieval Times for an incredible jousting tournament along with a four-course meal fit for royalty. Ride coasters, go-karts, and carnival rides galore at Fun Spot America or stroll through the brick-lined streets of quaint town of Celebration. Dreamed by Disney, Celebration Town Center hearkens back to simpler times from small town America. There’s much, much more to do here than you can imagine and it’s so close to the theme parks, you might not even realize your hotel is in Kissimmee! Yes, there are beautiful (man-made) beaches in Orlando if you happen to visit Discovery Cove, but if you want the real deal, you’ll have to travel a little farther east or west to reach another kind of paradise. Visit the Gulf of Mexico via St. Petersburg and Clearwater Beaches, a 26-mile stretch of pristine, sugar sand beaches with the most beautiful sunsets. On the way, visitors will pass right through the vibrant city of Tampa, too, so take a break and catch a safari at Busch Gardens or Lowry Park Zoo, one of the top zoos in the nation. 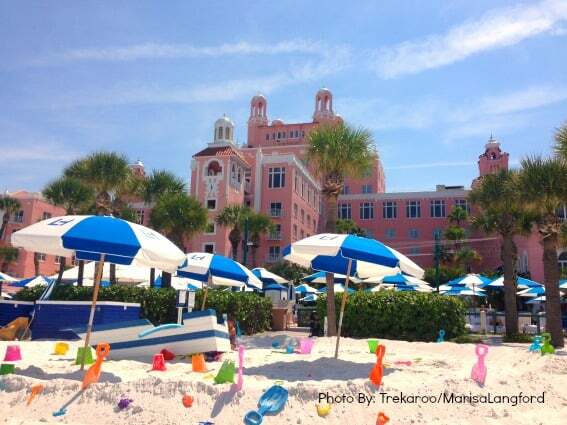 You’ll love staying at the Pink Castle on the beach (AKA The Loews Don Cesar). Head east 35 miles from Orlando to the Space Coast. 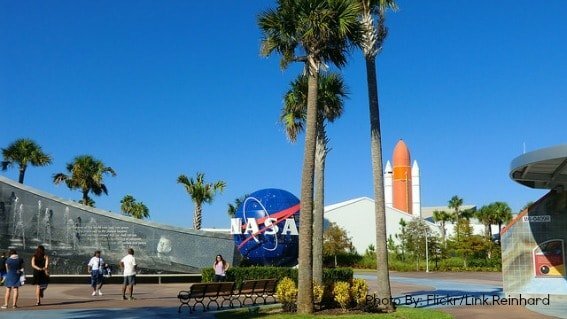 Surf the waves on Coco Beach or visit the Kennedy Space Center to see outer space like you’ve never seen before. Driving on the iconic Daytona Beach is always a fun experience too! Spend the night at The Shores and roast marshmallows to the sound of crashing waves. Wake up to the most beautiful sunrise and enjoy a peaceful walk on the beach. Swimming with the Manatees at the Plantation Inn on Crystal River is something you do not want to miss out on! It is one of the few places in North America where you can legally swim with these endangered species. Swimming with the gentle giants, touching them, and experiencing their water play is truly amazing. Crystal River is about an hour-and-a-half from Orlando, but if you’re this far south and it’s on your list, go for it! 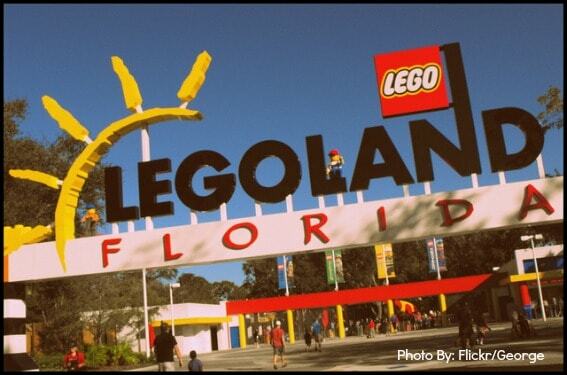 One more theme park just 45 minutes southwest of Orlando in Winter Haven is LEGOLAND Florida. As the largest LEGOLAND Park in the world, it has more than 50 rides, its own water park, and will soon include the new LEGOLAND HOTEL, opening in 2015. This park is a must visit for any Lego enthusiast from age 1 to 99 (however it is geared towards kids ages 2-12). Their newly opened DUPLO Valley is the perfect place for toddlers. Kids of all ages will enjoy the MINIland USA, LEGO City where kids can drive their own Lego car, or the LEGO World of Chima with their family interactive water ride! Bring your walking shoes as this park, along with the water park, sprawls across 150-acres! Planning a trip to Orlando can be overwhelming at first. 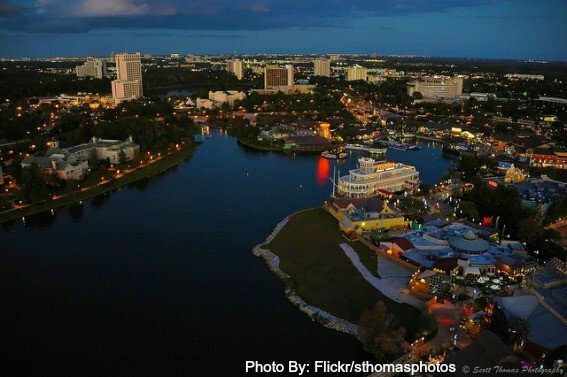 Take a deep breath and start by talking to the kids about what Orlando has to offer. Make a list based on what they might really want to experience from the top Orlando attractions. Don’t try to see everything; not even those who live in Orlando have seen everything. Select your top activities to see and do, so you’ll be able to plan a stay at the perfect hotel close by. Summer vacations, winter and spring breaks, long weekends… let’s face it, it’s ALWAYS a perfect time to visit sunny Central Florida. You might just have to come back because a new adventure always awaits…once upon Orlando. Want more kid-friendly fun in Florida? 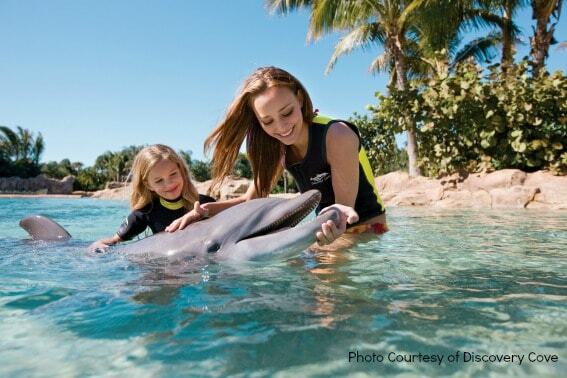 Check out our top ten things for families to do in Florida! 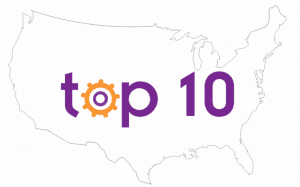 From coast to coast, we’re determining the Top 10 Things to do with Kids in each state (and now major cities!) of our great nation. Head hereto see what tops the list in your neck of the woods.